In SLO CAL, we take the term “farm-to-table” to heart. Case in point: You’ll find plenty of local chefs shopping from our more than 20 weekly farmers markets, which take place across the county. Not only will you find the freshest produce around, you’ll also be privy to locally made dairy products, honey, extra virgin olive oil, and artisanal goods like jams, jellies, vinegars and more. Whether you visit a farmers market in Arroyo Grande, Atascadero, Avila Beach, Baywood/Los Osos, Cambria, Cayucos, Grover Beach, Morro Bay, Nipomo, Paso Robles, Pismo Beach, San Luis Obispo, or Templeton, there’s nothing like knowing you’re taking home chef-approved produce grown locally by the area’s most celebrated farmers. As August turns to September, look out for juicy heirloom tomatoes, vibrant yellow squash blossoms and (always in season) all-star chefs! Quaint Downtown City Park in charming Paso Robles is the perfect scenic setting for picking up fresh produce for your next wine country picnic. The Paso Robles Farmers Market kicks off each Tuesday afternoon from 3 to 6 p.m. and is known for its singular down home hospitality (vendors will encourage you taste at every stand, and you might even run into a winemaker, rancher and chef all in one go). Tip: If you don’t manage to see La Cosecha/Il Cortile Chef Santos MacDonal among the rows of colorful produce, walk a block over and say hi yourself (plus, imbibe with an herby, garden-fresh cocktail made from Paso-grown ingredients). 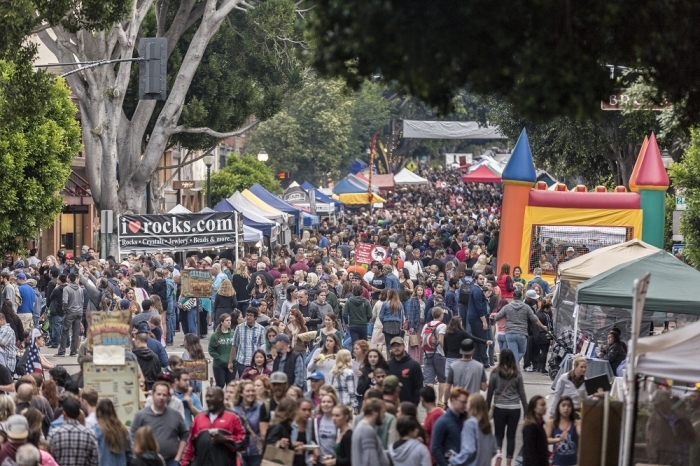 Arguably SLO CAL’s most famous farmers market, this eclectic celebration of food, farmers, and community spirit is a Thursday night tradition dating back more than three decades. Located downtown on busy Higuera Street, nestled between Osos and Chorro Streets, this one-of-a-kind foodie spectacle includes more than a dazzling array of local vendors (everything from cheese to extra virgin olive oil to lavender soap is at your fingertips). You’ll also find barbecue vendors, street musicians, youth performers, and fun, new additions like craft beer from Barrel House Brewing, sustainable cuts of meat, ancient grains, and charcuterie. If that wasn’t enough excitement to keep your tastebuds busy, get this: That guy or gal feeling up the avocados next to you might just be chef of one of SLO CAL farm-to-table favorites, like Big Sky Cafe, Foremost Wine Company, Buona Tavola or Cafe Roma. No wonder this big little market is world famous! 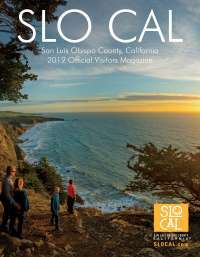 In general, SLO Cal is known for its fertile soil, temperate weather, and long growing season, but Arroyo Grande—in particular—has won the jackpot in terms of location. Here, traditional agricultural farms, vineyards, and flower growing operations create a unique and enviable harvest. Nowhere is this bounty on better display than at the Arroyo Grande Farmers Market, which takes place Saturday afternoons from noon to 2:30 p.m. in Olohan Alley and Short Street in Centennial Park. Located near an ancient footbridge, antique-feeling downtown village, modern eateries, and oodles of vintage stores, this farmers market is perfect for a low key afternoon out and about. Tip: Dine at nearby Mason Bar to see just what farm-to-table flavors are freshest now. Oh, and watch for wild roosters, which speckle the village, giving it that added rural appeal! Protected in a calm back bay setting, the Los Osos/Baywood Farmer’s Market affords a cool coastal vibe unlike any other on the Central Coast. The peaceful lapping waters and unique offering of SLO-grown goods make this market—which kicks off Monday afternoons from 2 to 4:30 p.m. off 2nd and Santa Maria Street—a go-to for local chefs. Fun fact: Most chefs are off during Monday afternoons, which means you stand an optimal chance of running into culinary creators from across the entire county, including the folks behind Mint + Craft, Novo Restaurant & Lounge and so many more. Consider it a SLO chef’s best kept secret! Home to Hearst Castle, avocados, moonstones, and cool climate wines, SLO CAL’s north coast offers up an embarrassment of riches folded into one super cozy seaside town. Known for its dramatic, pine-streaked skyline and laid back allure, Cambria’s Farmers Market—hosted on Main Street and Cambria Road Friday afternoons from 2:30 to 5:30 p.m. each May-October and from 2:30 to 5 p.m. November-April—is just as enchanting. Tip: Art galleries glitter on nearly every corner in downtown Cambria, so make time for a little window shopping, too.